ENJOY THE PACIFIC NORTH WEST IN STYLE! BOOK NOW FOR YOUR NEXT OUTING! WELCOME TO PARTY BUS SEATTLE! Our limousine service is professionally and courteously run by a team of great people are all distinguished & dedicated providers of the highest level of luxury limousine ground transportation with professionalism & dependability. We are conveniently located in the Seattle metropolitan area. It is our pleasure to provide ostentatious party buses, luxurious limo buses, posh stretch limousines, en vogue SUV limos, and also executive sedans that provide airport drop off services among other corporate needs or transportation service to and from any special occasion or night out on the town. If you have a transportation need, we have the vehicle ready and waiting to fulfill your requirements (a courteous & professional chauffeur included)... We exist not only to fulfill your needs however. Perhaps that was an understatement. We strive to completely satiate your need to be pampered and ultimately taken care of like the VIP you are! To top it all off - you'll find that while we provide world-class late model party buses and other luxurious transportation with comfortable wraparound plush leather seating, we are far more affordable than you might imagine. In our view, it simply is not good business for us to try and squeeze every bit of profit we can get out of our clientèle as soon as they travel in one of our stretch limos we would rather you enjoy your reservation so you book again and again. So, we set reasonable and fair rates based on various current market conditions, to ensure that our conscientious business practices earn us clients for life! We are fortunate to be located in a city which is known around the United States to be a trendy city filled with hot spots, exciting landmarks to see, and unbelievable natural beauty. Our lively city is nestled within the Olympic mountains and is bordered by the vast Pacific Ocean. To put it lightly, our thriving metropolis is a picturesque locale that all enjoy, and you’d be remiss not to plan visit here regardless of your tastes. 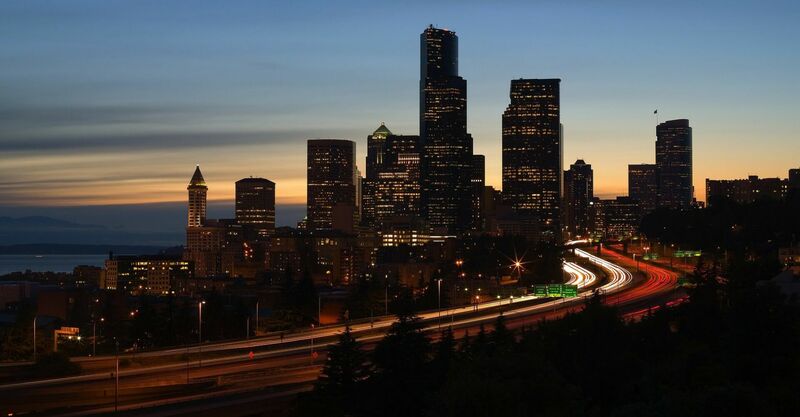 When you live in or visit the Seattle area, you should trust your luxury transportation to none other than the top company for Seattle limousine service. You'll find that we are the very finest option in the area for a Seattle Party Bus rental! Over the years we have become the preferred go-to company for unbelievable luxury transportation service. You won’t find a company in the state with better vehicles or quality of services, and that’s a guarantee. Maybe we’re a little biased, but we’re known to accommodate any and all itineraries, ranging from a night out on the town, to a black tie corporate gathering. If you need suggestions on anything related to our luxurious transportation services, don’t worry, our customer service agents and chauffeurs are happy to help in any way possible. If you are from out of town, and should you also need suggestions on some great sights to see, we intimately know all the best spots in the area, and will do our very best to give you some recommendations! Speaking of our agents and chauffeurs, you'll find that our studious pursuit of only the very finest people in the industry is to your principle benefit. We are a collective of the very finest and best luxury transportation providers in the SeaTac area, and we have no problem admitting that our dedication is a prime correlation to our success in this industry. We are never done working to improve, either. It would go outside our mantra to just rest on our laurels. We are an organization that is constantly striving to deliver the best experience imaginable. In doing business with us, we know you'll realize the same. If you’re ready to book limo bus or limo service call us to book now or to just receive a free no hassle quote, or you need more questions answered, you can call or email us at your earliest convenience... Regardless of the time of day or night we have 24 hour phone lines and we operate our ground transportation rental company 365 days a year! Chances are, if you are here looking for the very best in luxury limo chauffeured transportation, you have a very special day coming up. Rest assured in knowing that we have provided the very finest in service to innumerable clientèle for their weddings, their children's high school dances, their bachelor & bachelorette parties, their most memorable tailgate parties, and well, just about any event that has ever been held here in Seattle. If you have a special day, we want to be there to ensure that you enjoy every aspect of that day.... Even "getting there" will exceed your expectation. However, we have also provided some of the most relaxed and enjoyable services for events that you may not have considered getting a party bus for before. Seattle plays host to a plethora of annual events, festivals, and concerts that make for the perfect opportunity to be pampered a bit more than usual. We have provided service for such big shindigs like the Chinese New Year's Celebration, The Summer BBQ Days, The Fremont Fair, The Seattle Pride Parade - the list goes on and on! You may also want to consider our services for enjoying some of the most beautiful scenery our area has to offer. Sightseeing tours are a great way to get to know our city, and our chauffeurs always enjoy showing the coolest spots to both newcomers and seasoned veterans of our area. Since there are great casinos nearby, you may also enjoy getting some of your friends and family together to hit the slots or blackjack tables. Don't forget too, that our wine scene is growing, and our brewery scene is world class. Always keeping in mind that no one wants to go out and enjoy some adult beverages and then get behind the wheel. We'd be happy to ensure everyone's comfort and safety no matter what your plans are. If you happen to have ideas of your own, we'd love to hear them! With our professionalism, you will have the utmost confidence. Confidence that we can provide you with an exemplary service and a world-class vehicle to enjoy - for whatever it is you enjoy the most. Give us a call at any time. We look forward to helping you!